How much time does it take to be successful as an impact-driven entrepreneur? A question probably every entrepreneur asks himself (at least at some point)… how long will it take for my business to be successful?! For obvious reasons, there is not 1 clear answer that would suits everyone (and those who say “3 years” without even knowing your situation, market, and objectives, can only be wrong!). That said, being able to compare how much time YOU have, and how much is reasonable to achieve in that time frame, can definitely help you adjust your strategy along the way. And so in this article, you’ll learn everything we have discovered by running our own purpose-driven businesses (and supporting over 100 changemakers in the past 3 years combined), in finding the balance between time spent and results. Why Time is of the essence. Entrepreneurship is not a speed race, it’s a long marathon. It’s about using your resources (and fuel) wisely in order to last enough to reach your objectives. If you cannot convince enough customers to buy your solution fast enough, you cannot reach break-even or later financial sustainability. If you cannot have meaningful impact on your beneficiaries life (they may find your solution “nice” and even be happy about your product/service, if the cause you are trying to tackle doesn’t get impacted at all by your so-called solution, you’re not actually helping), you’ll start be less and less motivated about the work you’re doing. In other words, in order to reach financial sustainability, as well as in order to create a significant-enough impact for you to keep your motivation up (as well as the one of your stakeholders), you need to work on timing. The good news is: it doesn’t need to be perfect from the beginning. Your communication efforts might take 5, 10, 100 prospects before you start knowing exactly what strings to pull in order to convince enough of them to invest in your solution, and eventually be financially sustainable. Your service/product delivery might need iteration and improvements before it actually has the impact you originally intended (or the impact you end up wanting to have, as this very often evolves during the journey itself). What is important is that you define a clear time frame. That you know what are the limits within which you’ll need to “find a way to make it work”? You can come up with other questions tailor-made to your own initiative. What’s important is that you get super clear on your time frame and divide it into small milestones in order to adapt and refine your methodology along the way. You’d be surprise to learn that — according to Bloomberg — 80 to 90% of start-up businesses don’t survive until their 1st year anniversary. When we talk about classic startups, it can be considered “sad” for the entrepreneur who puts his hopes high and then gave up (quite fast, if you want our opinion). But when it comes to purpose-driven businesses, started by purpose-driven individuals (whether they call themselves social entrepreneurs or not), it is such a waste! Imagine all the positive impact, the lowered environmental footprint, and the millions of lives changed if they had not given up that easily?! The truth is, business success is easy : you “just” have to not give up (and keep on iterating until you find a way to make it work). You don’t have enough time and/or money to keep on trying. You have to go back to the corporate world, as you realized your business cannot support you (and or your suppliers, stakeholders, and so on). You started with great hopes and lots of enthusiasm, and yet somewhere along the way you let yourself get demotivated by the circumstance or some negative responses to your work. Worse, the fear of failing, the fear of not being able to serve your clients, or the fear of not being able to reach financial sustainability have consumed you so much that you found yourself paralyzed. Entrepreneurship is not an easy career choice. It is certainly one of the most fulfilling ones, but it does require commitment and tenacity before you can reap the fruits : being free to be your own boss, working with whoever you please, calling your own shots, changing other people’s life and building your own legacy. If you do have some resources (time and / or money) left to invest in your business, and if you have the motivation to do all you can to “find a way to make it work” within the timeframe that you have set for yourself, then good news: you are on your way to success! Now, there is one key accelerator factor you should absolutely capitalize on in order to succeed as an impact-driven entrepreneur: learning from others. Learn from others mistakes! Look at what is working! Trying to apply best practices in your business! There is no need for you to reinvent the wheel. Today, at the age of internet where you have access to so much knowledge and connections, trying to figure it all out on your own is a serious waste of opportunity. 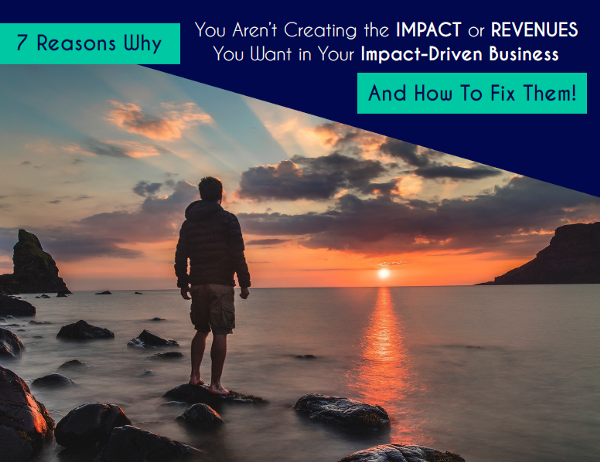 Here is something you’ll probably love : a PDF guide compiling the 7 Reasons Why You Aren’t Creating the IMPACT or REVENUES You Want in Your Impact-Driven Business (And How To Fix Them!). This guide was created after years of (successfully) running our own purpose-driven businesses, and supporting over 100 impact-driven entrepreneurs (from +17 countries) combined. You can download it for free (our hope is that it helps you identify what might be slowing you down, so you can adjust your strategy and reach your goals in the timeframe that you set for yourself!). Inside, you’ll discover the 7 issues we have witnessed Changemakers struggle with (including Business Model complexity, gap between amount of work and actual results, reaching out to enough ideal customers; just to name a few) AND the most important strategy to focus on if you find yourself in this situation. Who cares how much time it takes to be successful “in average”. What matters is that YOU manage to find a way to be successful enough within the time frame you have (and regarding the time and money resources you can afford to invest). We hope that the PDF guide we’re offering nowadays is going to help !